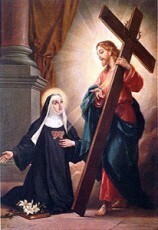 Saint Clare of Montefalco was born in 1268. Clare was born into a well-to-do family, the daughter of Damiano and Iacopa Vengente. Her father built a hermitage within the town where Clare’s older sister Joan and her friend Andreola, lived as Franciscan tertiaries as part of the Secular Third Order of St. Francis. In 1274, when Clare was six years old, the Bishop of Spoleto permitted Joan to receive more sisters, and at that time, Clare joined the Third Order of St. Francis (Secular), moving into the hermitage and adopting the Franciscan habit. By 1278 the community had grown too large, and they had to build a larger hermitage farther from town. In 1290 Clare and her sister Joan desired a more strict monastic life, so the Bishop established a monastery according to the Rule of St. Augustine. Clare and Joan made her vows of poverty, chastity, and obedience and they became Augustinian Nuns. Joan was elected as the first Abbess, and their small hermitage was dedicated as a monastery. A year later, on November 22, 1291, Joan died and Clare, out of obedience to the Bishop, was elected Abbess. In 1294 during the celebration of the Epiphany, Clare fell into ecstasy and remained in that state for several weeks. Unable to eat, the Nuns sustained Clare’s life by feeding her sugar water. During this time, Clare reported having a vision in which she saw herself being judged in front of God. Clare also reported having a vision of Jesus dressed as a poor traveller. She described His countenance as being overwhelmed by the weight of the cross, and His body as showing signs of fatigue. Clare knelt in front of Him, and trying to stop Him asked, “My Lord, where are you going”? Jesus answered her, “I have looked all over the world for a strong place where to plant this Cross firmly, and I have not found any”. After she reached the cross, making known her desire to help Him carry it, He said to her, “Clare, I have found a place for My cross here. I have finally found someone to whom I can trust mine cross”, and He implanted it in her heart. The intense pain that she felt in all her being, upon receiving the cross in her heart, remained with her. The rest of her years were spent in pain and suffering, and yet she continued to joyfully serve her fellow Nuns as their Abbess. In 1303, Clare built a church in Montefalco, which served as a Chapel for the Nuns and a church for the town. It was blessed by the Bishop of Spoleto, and was dedicated to the Holy Cross. Clare served as the Abbess, teacher, mother and spiritual directress of her Nuns. Clare’s reputation for holiness and wisdom attracted visitors to the Monastery of the Holy Cross, but she continued to still govern the monastery with care. Clare served as Abbess for sixteen years, and in August 1308, she become so ill, that she was bedridden. She asked to receive Extreme Unction, and on the next day, sent for her brother to come to the monastery. Clare made her last confession on August 17th, and died in the convent on August 18th. Immediately following Clare’s death her heart was removed from her body, and upon inspection it was repoted that symbols of Christ’s passion, a crucifix and scourge were found within her heart. The Bishop immediately rushed there to see it, assuming the Sisters implanted the symbols there. A commission of physicians, jurists, and theologians investigated, and “ruled out the possibility of fabrication or artifice”. The Bishop appologized and ruled out trickery. The crucifix reportedly found within Clare’s heart is about the size of a thumb. Christ’s head leans slightly towards the right arm of the crucifix, and his body is white, except for the “tiny aperture in the right side which is a livid reddish color”. The scourge and crown of thorns are apparently formed by whitish nerve fibers, and the three nails are formed of a dark fibrous tissue. The body of St. Clare remains incorrupt today, although the skin of her hands has darkened somewhat, over time. St. Clare’s heart is displayed yet today, in veneration at the Church of Saint Clare in Montefalco where her body, dressed in her Augustinian habit, rests under the high altar. While her canonization process was initiated in 1328, it was not until April 13, 1737, that Clare was beatified by Pope Clement XII. On the feast of the Immaculate Conception, Pope Leo XIII canonized Clare as St. Clare of Montefalco at St. Peter’s Basilica in Rome. She is recognized as an Augustinian Nun, rather than a Franciscan. St. Clare took up the religious life at the age of six. She knew from a very early age that she was to serve the Church and others. She started as a Third Order Franciscan, but eventually took vows as an Augustinian Nun. She served the Sisters by being their Abbess, and had a profound vision of Jesus. She remained in ecstasy for several weeks, and accepted the cross that Jesus planted in her heart. Upon death, there was a crucifix and a scourge actually implanted in her heart. Her heart was removed upon her death, and is venerated today in the Church in Montefalco, where these symbols that Jesus implanted there, can still be seen. Her body, more than 700 years later, is on display under the high altar, and is incorrupt to this day. St. Clare shows us that faith can be obtained to such a deep level, miraculous things can happen; and that faith can be of benefit to others. She showed us how to serve the Church well, and asks us all to do the same in whatever state of life we are in. Don’t forget to ask her to intercede for us, when we need help to serve others.